The Ballston Spa School District serves portions of the towns of Malta, Milton, Ballston Spa, and Charlton, as well as the Village of Ballston Spa. The Ballston Spa School District's district's total enrollment includes approximately 4,400 students, K-12. The district includes four elementary schools (Wood Road Elementary, Milton Terrace South Elementary, Milton Terrace North Elementary, and Malta Avenue Elementary), Ballston Spa Middle School, and Ballston Spa High School. 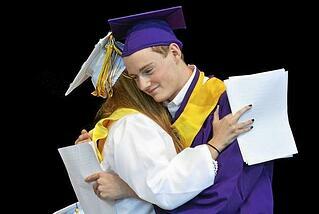 In 2010, Ballston Spa High School was recognized as one of “America's Best High Schools” by Newsweek Magazine. The following year in 2011, Ballston Spa High was given the exact same recognition by the Washington Post. Also in 2011, Ballston Spa High was recognized as one of 388 high schools in the country that increased access to AP coursework while maintaining achievement levels. Ballston Spa High School is an International Baccalaureate (IB) World School, offering students a rigorous, two year liberal arts education in fulfillment of the International Baccalaureate Diploma. IB World Schools are considered highly by college admissions committees. For more information about Ballston Spa High School's IB World School program, click here. Ballston Spa High School is equipped with state-of-the-art computer and science labs, a modern library media center, performing arts auditorium, and swimming pool. BSHS offers AP courses in Art, English, Mathematics, Science and Socials Studies. BSHS also participates in University in the High School/College in the High School, a program enabling students to take college credit courses while enrolled in upper level high school courses. After school sports available to students include Cross Country, Football, Golf, Soccer, Tennis, Baseball, Bowling, Ice Hockey, and many more. For complete information, visit the Ballston Spa Central School District home page. Ballston Spa Middle School boasts numerous clubs and extra-curricular activities in addition to an exceptional Math, English, Sciences and History curriculum. Students can choose to take part in Art Club, Best Buddies, International Club, Jazz Band, National Junior Honor Society, Odyssey of the Mind, Penny Harvest, Robotics, Ski Club, Science Bowl, and many more activities designed to stimulate and push students to reach their fullest potential. See the Ballston Spa Middle School home page for complete information. The Ballston Spa Central School district has recently undergone a $49 million facilities improvement project that included the development of a new elementary school, the renovation and restoration of Malta Avenue Elementary School, and renovations at the Ballston Spa Middle School. The district is supported by a dedicated staff of more than 600 educators, administrators, and support team. Ballston Spa fully complies with New York State Learning Standards.